The world of digital marketing is all about balance. On one hand, we find more “traditional” websites, SEO, and Search Ads, and on the other hand, Social Media Marketing. Its not really a matter of picking one over the other, but rather knowing how to use both of them to compliment each other. We built a landing page. Landing pages are an indispensable part of online marketing. Essentially a landing page is a granular page of your website that focuses on one thing, and one thing only. In Tri-City Renovations’ case, we wanted to let people know two things. One, that they would be returning to the Greater Moncton Home Show, and two, if you placed an order with them at the home show, you’d get a home show exclusive deal. Using the new Google My Business (GMB) post function, we built a GMB post that would run up until the end of the event. The post included the dates of the event, the booth numbers, and a link to the landing page. We also used a picture from last year’s home show to visually draw people’s attention to the post. We shared the landing page on Facebook. By using our current followers and likers, we were able to leverage that goodwill into likes, shares, and reach. Phenomenal organic results (non-paid search results) were achieved by combining multi-platform marketing. But what impact did this have on their website traffic? 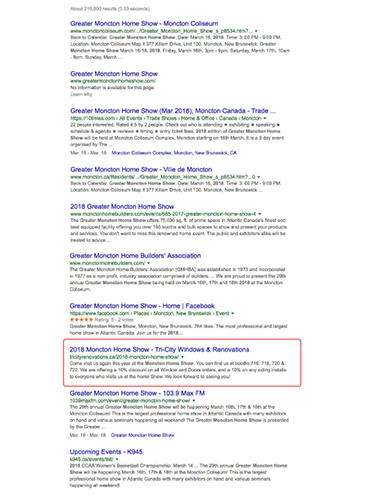 Well, after looking at Google Search impressions over the life of the Tri-City Renovations website, the home show landing page was second for all time results, after only being live for three weeks. In a matter of numbers, the difference between the landing page, and the Past Projects page (in third place) was 172%. Obviously, that is a huge increase. What this case study shows us is that while SEO, Social Media, and Google My Business are all great tools, using the right mix of all of them together can boost your results and bring your digital marketing to the next level!